A construction worker assembles part of the roof for the Wawa Welcome America stage at Eakins Oval in Center City Philadelphia on Friday, June 29, 2018. An excessive heat warning issued by the National Weather Service warns of heat index values as high as 107 degrees on Sunday and Monday. In effect from 8 a.m. Sunday to 8 p.m. Monday, the warning says the heat index on Sunday will be between 100 and 105 degrees, and rising Monday to between 103 and 107 degrees. The heat index is what the temperature feels like to the human body when relative humidity is combined with the air temperature. Real temperatures will be in the mid- to upper-90s on both days, forecasters said. The heat index will likely exceed 100 degrees on Tuesday and Wednesday as well. 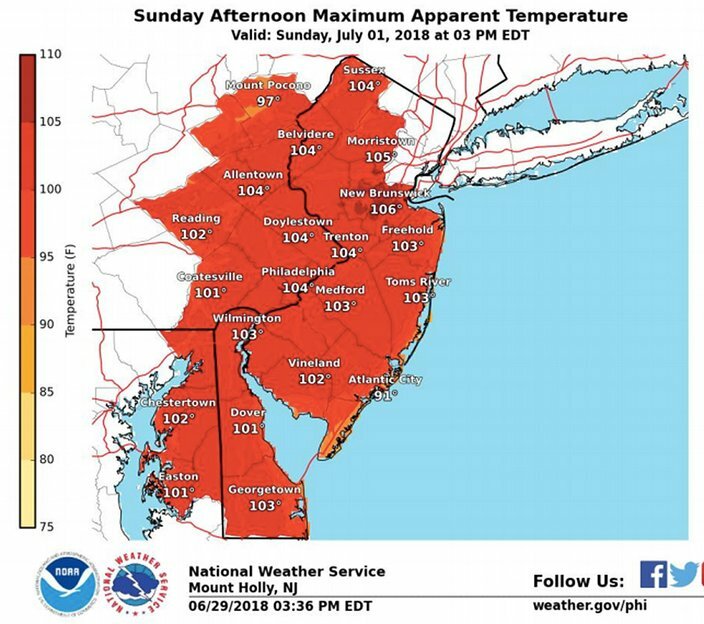 At the Jersey Shore and in the city's far western suburbs, a heat advisory is in effect for the same time period. Forecasters warned that such prolonged high temperatures can be dangerous. Anyone overcome by heat should be moved to a cool and shaded location. Heat stroke is an emergency. Call 911. Those who work outside or spend time outdoors are advised to take precautions. The Occupational Safety and Health Administration recommends scheduling frequent rest breaks in shaded or air conditioned environments. • Learn the signs and symptoms of heat exhaustion and heat stroke. • Wear light weight and loose fitting clothing when possible and drink plenty of water. • Reschedule strenuous activities to the early morning or evening. • Young children and pets should never be left unattended in vehicles, especially during warm or hot weather when car interiors can reach lethal temperatures in a matter of minutes. • Drink plenty of fluids...stay in an air-conditioned room...stay out of the sun...and check up on relatives and neighbors. Friday night: Mostly clear, with a low around 73. Northwest wind around 5 to 9 mph becoming light after midnight. Saturday: Sunny and hot, with a high near 97. Light and variable wind becoming west 5 to 8 mph in the afternoon. Saturday night: Clear, with a low around 77. West wind around 7 mph. Sunday: Sunny and hot, with a high near 99. Heat index values as high as 104. West wind 3 to 6 mph. Sunday night: Clear, with a low around 75. Monday: Sunny and hot, with a high near 98. Monday night: Mostly clear, with a low around 76. Tuesday: Mostly sunny, with a high near 97. Tuesday night: Partly cloudy, with a low around 75. Independence Day: A chance of showers and thunderstorms. Mostly sunny, with a high near 92. Chance of precipitation is 30 percent. Wednesday night: A chance of showers and thunderstorms. Mostly cloudy, with a low around 73. Chance of precipitation is 30 percent. Thursday: A chance of showers and thunderstorms. Mostly sunny, with a high near 91. Friday night: Mostly clear, with a low around 71. Southwest wind 3 to 8 mph. Saturday: Sunny, with a high near 87. Calm wind becoming southwest 5 to 8 mph in the afternoon. Saturday night: Mostly clear, with a low around 72. Sunday night: Mostly clear, with a low around 74. Independence Day: Mostly sunny, with a high near 82. Wednesday night: Partly cloudy, with a low around 73. Friday night: Mostly clear, with a low around 63. Northwest wind around 5 mph becoming calm in the evening. Saturday: Sunny, with a high near 88. Calm wind becoming west 5 to 8 mph in the morning. Monday: A chance of showers and thunderstorms after 2 p.m. Sunny, with a high near 90. Chance of precipitation is 30 percent. Tuesday: A chance of showers and thunderstorms. Mostly sunny, with a high near 87. Chance of precipitation is 30 percent. Tuesday night: A chance of showers and thunderstorms. Mostly cloudy, with a low around 69. Chance of precipitation is 30 percent. Independence Day: A chance of showers and thunderstorms. Partly sunny, with a high near 85. Chance of precipitation is 30 percent. Wednesday night: A chance of showers and thunderstorms. Partly cloudy, with a low around 68. Chance of precipitation is 30 percent. Thursday: A chance of showers and thunderstorms. Partly sunny, with a high near 85.